Brewster Girls Ski Team says Thank You! 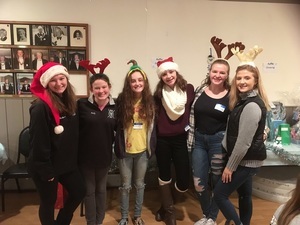 This past Sunday, December 3rd, members of the Brewster Girls Ski Team came together at the Brewster Elks for a fundraiser paint party, raising $525. The girls helped community family members paint snowman on mason jars. In addition, over 20 raffle items were available, as well as donated pizza, cookies, cupcakes and ice cream. The money from the fundraiser is being used by the Brewster high school ski team so they have the opportunity to get matching apparel. If anyone wanted to donate, money can still be sent to Brewster Ski Team, PO BOX 175, Brewster, NY 10509.